So for, I’ve shared some cube theory and how to use it to build a pool of cards that create a cube. I’ve discussed establishing a cube’s foundations. Now it’s time to bring a concrete example to the party and discuss how to make these initial lessons come to fruition using the white section of a commons cube. I created a pool of white cards through normal means, like looking through the Gatherer, personal experiences with cards, and checking other cube’s lists. Look at this mess! I wanted to make the hypothetical white section an even 65 cards but this pile is almost twice the size of that! It looks like a daunting task but the best way to approach this is to do it in small chunks. If you haven’t already, you should sort your cards by mana cost. This is how the pile breaks down. Now that you’ve organized your potential section by casting cost the first step is understanding what the color can do at each mana cost and keep the cards that are “above the curve” for their mana cost. Why use “above the curve” in quotation marks? You can’t simply always auto-include the best cards at a given mana cost and call it a day. That is, not every cube-worthy 2-drop in green is going to be as good as Tarmogoyf and not every cube-worthy 2 mana blue spell is going to be Mana Drain. Let’s look at River Boa for example. In a powered cube it’s weaker than Tarmogoyf (and by a pretty big margin, but what 2-drop isn’t). Yet, River Boa’s a really good cube card and considered a staple at that! Why? It’s because it doesn’t make sense to dismiss River Boa just because it’s not Tarmogoyf. While it doesn’t have three or more power for 1G like Tarmogoyf it still is excellent compared to other green cards at 2 mana. Two power isn’t anything amazing, but cheap regeneration and a relevant landwalking effect make it above the curve for 2 mana creatures. And in the context of a commons cube its power is even more relevant because its competition gets weaker! Similarly, Lightning Bolt is the most efficient burn spell ever printed (with, perhaps, only Fireblast beating it when you cast it for free) and it’s an obvious cube inclusion because there’s nothing better at nearly any mana cost. YetIncinerate is still cubeworthy because even at 2 mana three damage is still very efficient given what the curve establishes for burn effects. Going further, even Volcanic Hammer and Fire Ambush, sorcery-speed versions of Incinerate (that also lose the regeneration hosing!) are often good enough for cubes because their effect remains efficient: threee damage for 2 mana, even at sorcery speed, is good enough! Does it matter that these three 2-mana burn spells are “worse” than Lightning Bolt? Nope! Let’s apply this to the white removal cards in the pool of cards. Pacifism, Journey to Nowhere, Temporal Isolation, Oblivion Ring, and Faith’s Fetters are considered the top staple white enchantment-based removal spells for commons cubes. But what about other cards like AWOL, Guilty Conscience, and Neck Snap? Should they get cut from the pool? Neck Snap’s a pretty easy cut as it just gets outclassed by almost everything available. AWOL shares a pretty similar fate for similar reasons. Guilty Conscience may be dirt-cheap but its overall effect is very weak and situational. Overall, I think that none of these cards are good enough to make the cut. They each have their own benefits but aren’t prime to shine here. White-Red: Generally aggressive. Goes into battle with lots of cheap creatures and stops troublesome blockers with either burn or removal, and packs artifact/enchantment answers to boot. Thanks to Red’s burn, most red-white decks have a lot of reach to simply end games. White-Blue: Generally controlling. Uses white enchantment-based removal and counterspells to prolong the game where the card advantage gained over the course of many turns allows the player to win… eventually. White-Black: Generally aggressive, sometimes more controlling. Aggressive white-black decks utilize cheap and powerful creatures on both colors, ignoring drawbacks on bodies like Carnophage, use tons of removal to destroy opposing blockers, and apply some disruption. Control variants seek to use the same removal cards (as well as black’s mass-removal cards) to prolong the game and win through through recursion effects. White-Green: Generally aggressive, sometimes midrange. Green gives white mana acceleration and solid top-of-the-curve beef, which is why the archetype is friendly for midrange as well. Green’s myriad of subtle 2-for-1s (like in Civic Wayfinder or Penumbra Spider for pauper cubes) give midrange strategies a solid base to win through card advantage. You’ll notice that only one of the archetypes in white really goes for the control route, white-blue, and that the other three color pairs are aggressive. It’s important to keep this configuration in mind so that white decks will have sufficient support for its decks as you evaluate which cards stay and which cards go. It’s a common pitfall for powered cube designers to put every mass-removal effect into white. Winds of Rath, Kirtar’s Wrath, Austere Command, and a few others piled into a very crowded top-end. This is wrong because it fails to acknowledge that there may not be any need for this many mass-removal effects in white. While archetypes like white-red and white-green ramp that could certainly enjoy a Wrath or two, but having every Wrath under the sun in a cube is ignoring the fact that a majority of its decks don’t need these effects. Similarly, it’s important to not have too many top heavy mana cost cards in general in a white section as the mana curve should have a good amount of cards at 1 mana, peak at 2 and gradually decrease along the mana curve; the curve should reflect the aggressive tendencies of the color. For powered cubes I’ve found that the average mana cost for white should be not too far from 3, likely somewhere between 3 to 3.3, so that aggressive decks can thrive and have appropriate support yet control decks have their tools present and accounted for as well. However not every low-cost card is going to help aggro decks:white aggro decks in common and common/uncommon cubes won’t want to use Kirtar’s Desire or Condemn as these cards are awful for those archetypes. I’ve discussed supporting aggro decks in cube elsewhere, but to summarize it’s very important to appropriately support aggro strategies in cube for the benefit of the entire experience, and the best way is through managing the mana curve. How do you calculate this? Fellow cube designer Adam Styborski has a really nice spreadsheet that he uses for his pauper cube, but there are other online resources to use as well. Deckstats.net allows you to post just a list of cards in your cube and it’ll calculate the average costs. You can even input alternate costs (like WWW for Spectral Procession instead of the n0rmally assigned 6 colorless) so that you can get a more accurate reflection of your mana curve. Just don’t cheat and say that something like Woodfall Primus is a 1-drop because it gets pitched to Entomb. That doesn’t mean that you should never consider these cards for your cube again. I have a small box of cards for my cubes that I use as a virtual “bench” for cards that aren’t in my cube right now but are very close to coming back (a topic I discussed over at Cubedrafting.com). Maybe I’ll need a token generator, or another 2-drop creature, or something else entirely. Whatever reason just because those cards aren’t in my cube right now doesn’t mean that they’re gone forever. Cards that were pared down from my initial pool, when I made my commons list, went to the bench. Eventually, some cards got taken out because of increased competition (like 5-cost green cards in my powered cube) but for the most part, those cards aren’t forgotten and are just waiting for the right circumstances to change. Like any good cube, this list is always subject to change. Refining a cube is an ongoing process which you’ll be doing for as long as you have your cube; taking cards out that aren’t doing that much, rebalancing archetypes and support, and many other things that impact your cube are all part of the adventure. As a cube designer, striving for Kaizen (constant improvement) is key. It’s the first step in a long journey but it’s an incredibly fun and rewarding one at that! If you have been looking to start building a cube I hope that this article has helped you to take those first steps. And if you’re an experienced cube designer I hope that you’ll consider creating a “bench” of possibilities for your cube. Going forward I’ll be discussing more advanced cube theory, around topics like opportunity cost, and will continue to reference ideas that were brought up in these introductory articles. Usman "The Rad" Jamil started playing Magic around the time of Revised and Fallen Empires, joining the mass of people who quit the game around Masques and came back to the game at the Betrayers of Kamigawa prerelease. Since returning to the game, he focused mainly on Limited formats and discovered the cube drafting format around the time of Morningtide. He has since become an expert in the fledgling format, through discussions, in-depth analyses, writing articles and maintaining a blog on the format at idratherbecubing.wordpress.com. 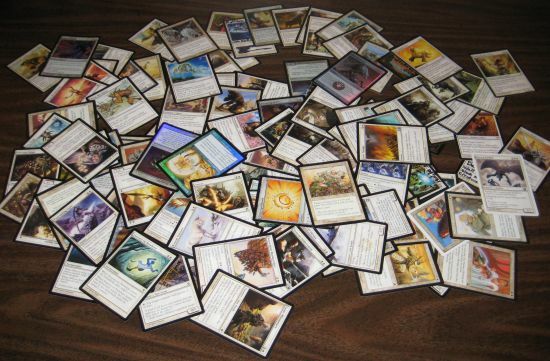 During his MBA studies, he focused on approaching Magic, especially cube drafting, from an efficiency and holistic-based point of view in a similar way that Japanese automobile manufacturers did in the 1980s. His quantitative and strategic background has given him a unique insight to the format. When he's not drafting the latest set or a cube, he is an active member of the cube community, sharing knowledge about the cube drafting format as well as providing occasional financial information on cubing and Magic.